Explore, Learn, Have Fun! : Pioneer Woman's Olive Cheese Bread ~ Amazing!! Pioneer Woman's Olive Cheese Bread ~ Amazing!! One of our most favorite recipes came from Pioneer Woman's Blog. Love, love, love her! I make this yummy, cheesy olive bread to go with pasta dishes, and also for potlucks and parties. It is always GONE fast!! It is creamy, rich, a little salty, and gooey/cheesy ~ the perfect bread as far as I am concerned! Over Memorial Day weekend, we had the usual hot dogs and hamburgers cooked on the grill. I bought more hot dog buns than we used though, and the extras were going stale fast. Katie is working fulltime this summer, so it was just me & David at home. 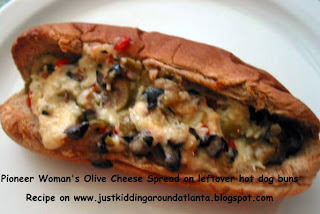 We both love olives, and I thought that making a smaller batch of olive cheese spread on the two extra buns would be a great way to use them up! Was I ever right! I think I liked it more on these individual serving size buns than on the larger loaves that I slice up! Here's the original recipe, straight from Pioneer Woman's first cookbook. You can use it on whatever bread you have handy!! 1/2 c mayonnaise - real mayo, no substitutions! Slice the french bread in half lengthwise, spread the olive cheese mixture in an even layer on each half. Bake 20 -25 minutes, until cheese mixture is thoroughly melted and beginning to turn light brown and bubbly. Cut into diagonal slices and serve immediately!! If you use hotdog buns like I did, just scoop the spread into the middle, and bake as directed. Can make cheese/olive mixture up to 2 days in advance, store tightly covered in fridge. Or spread mixture on bread and freeze , tightly wrapped for up to six months. Thaw before baking. Also super-good on crackers! Variation - substitute drained, chopped artichoke hearts and grated parmesan for the olives and jack cheese - yum!